So cute! Would't you just love to find him under the Christmas tree? He is adorable in his little tie! It reminds me of Clyde in his little T-shirt. I miss that. It sure helped him heal. He did not seem to mind wearing them. Maybe I should get him one for Christmas. *wink* Have a great weekend, dear friend. Hugs! Just look at that cute kitten with his spiffy tie. Too cute. Sandee, you and Zane have a super Friday and have some fun too. I just LOVE kitty's bow tie. Now where is his tuxedo? Have a wonderful Sandee & Zane. See ya. Oh my goodness, what a cutie, love the bow tie. kitties in bow ties! is there anything better?! thanks again for the link! (PS don't worry about old Amarula--I may have exaggerated the panic for dramatic effect---although I don't think she'll be climbing any trees again soon!! Such an adorable little kitty and bow tie fits ~ simplicity is beautiful! Sweet! that could have been me if I was here when I was that small! Thanks so much for adding us...we tried to do it on the tablet at 5:30 this morning, but were having difficulties. PS we LOVE your festive background! Awww! How sweet! All dressed and ready to play! Hope you have a wonderful weekend Sandee! 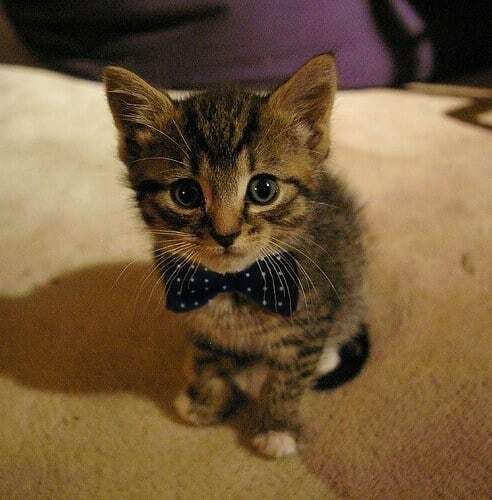 Wow, the bow tie is almost as big as the kitten. So lovely. aww cutest little bowtie (and kitty) ever! Have a wonderful Friday! Formal kitty looks very dashing. Awww! Such a cutie kitty! So handsome! Hey mom! Does this tie make me look more intellectual? I know dogs brains have more neurons, but looks are important, right? LOL, that kitty made me chuckle. Love the tie. What a cute guy. I hope he had a very fab weekend, since he looked so dapper and all.